Juhuuu! Heute kann ich es endlich verraten: Weil sich eine der regulären DT-Damen diesen Monat frei genommen hat, darf ich im Juli als zweite Gastdesginerin auf dem Create-A-Smile-Stamps-Blog mitmischen. Ich bin super glücklich und total aufgeregt, diese Chance bekommen zu haben! Für meine erste GD-Karte habe ich gleich das süße neue Critter-Set "Poppin' Over" verwendet, das mir auf den ersten Blick ans Herz gewachsen ist. Yaaay there! 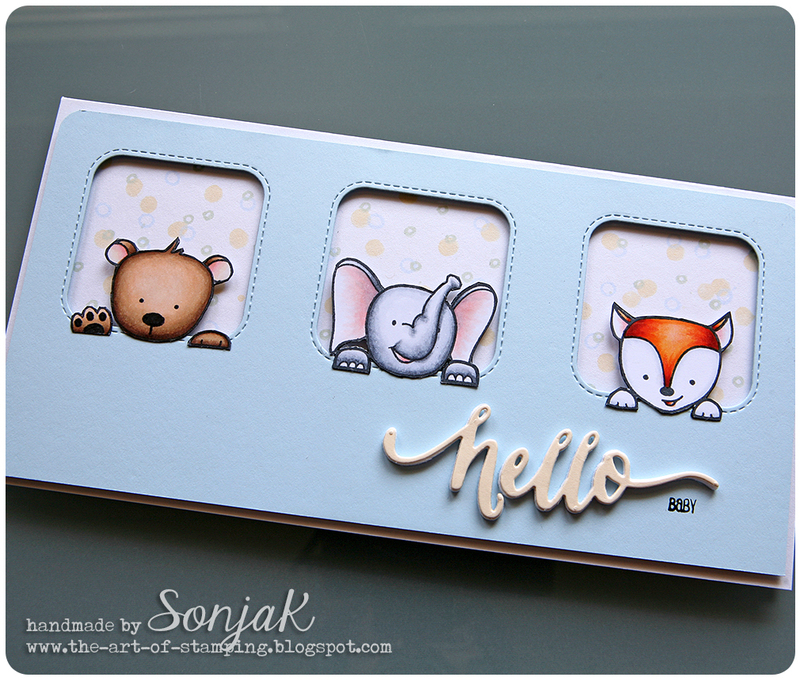 Today I may finally reveal it: One of the DT members at the Create A Smile Stamps Blog took a month off and so I've been given the chance to show some of my creations there as a second guest designer for the month of July. Isn't that fantastic? I'm super happy and excited to be allowed to do so! For my first GD card I've turned to the cute new critter set "Poppin' Over", which won over my heart at first glance. Beim Anblick der süßen kleinen Kerle kam mir sofort eine Babykarte in den Sinn - vielleicht weil mich die Art und Weise wie sie über den Rand lugen irgendwie an Kinder erinnert, die ganz neugierig ein Neugeborenes in seiner Wiege betrachten. Seeing those cute little guys I've immediately thought of a baby card - maybe that's because of the way they peep over the edge which reminds me of children curiously inspecting a newborn in his / her cradle. Koloriert habe ich die drei Tierchen mit Copics. Der lustige Konfetti-Hintergrund in den Fenstern ist mit diversen Mini-Stempeln aus zwei weiteren Create-A-Smile-Sets entstanden: "Magic Flowers" und "Perfect Tune". Ich gestehe, dass ich diese Mini-Stempelchen oft übersehe, wenn ich zum ersten Mal mit einem Stempelset arbeite, aber glaubt mir, es lohnt sich, sie genauer unter die Lupe zu nehmen, oft fallen einem gerade für diese Stempel die kreativsten Verwendungsmöglichkeiten ein. I've colored these three critters with Copics. For the fun confetti background behind the windows I've used various mini stamps from two other Create A Smile Stamps sets - "Magic Flowers" and "Perfect Tune". I've got to admit that I often overlook those tiny stamps when working with a new set for the first time, but believe me they're really worth a second glance. Quite often especially these kind of stamps allow for very creative uses. Wenn ihr übrigens wissen möchtet, wie genau die Karte entstanden ist, hüpft einfach mal rüber zum Create-A-Smile-Blog, dort gibt es eine Anleitung zum Nachbasteln. By the way, should you want to find out how exactly I've made this card just hop over to the Create A Smile Stamps blog where you find some instructions that may help you to recreate it yourself. Stempel: Create A Smile Stamps "Poppin' Over", "Magic Flowers", "Perfect Tune"
Stempelkissen: Memento "Tuxedo Black", Versafine "Onyx Black", Hero Arts "Soft Leaf", "Soft Sky", "Soft Vanilla"
Stanze: WPlus9 "Hand Lettered Hello", MFT "Inside & Out Stitched Rounded Square Stax"
Die Karte ist soooo tolll geworden! Wie schön, dass du Gastdesignerin bei Create a Smile bist! Ich freue mich schon auf deine nächsten Werke! What an absolutely charming little card! I really love the look of it with the three openings and the adorable animals poking their heads through! 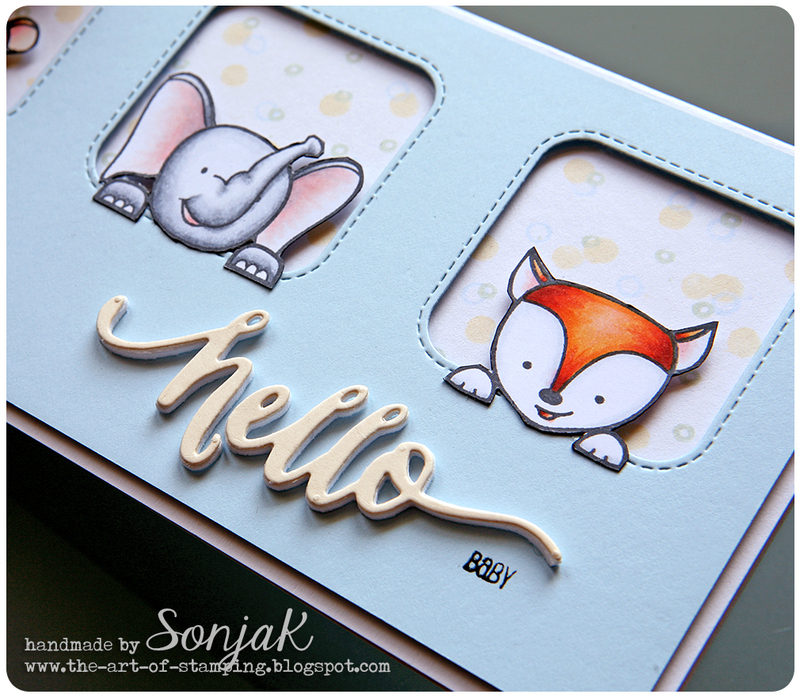 This has amazing dimension with those cut-out's and I really like how you did the "hello baby," sentiment. This is a wonderfully original baby card and I'm so glad you shared it with us for this week's Simon Says Stamp Monday Challenge! Oh, wie süß!! Dein Kärtchen ist so toll geworden!! Sonja, so so cute! Love the lay-out!! And your colouring so beautiful! And hit the enter too soon! 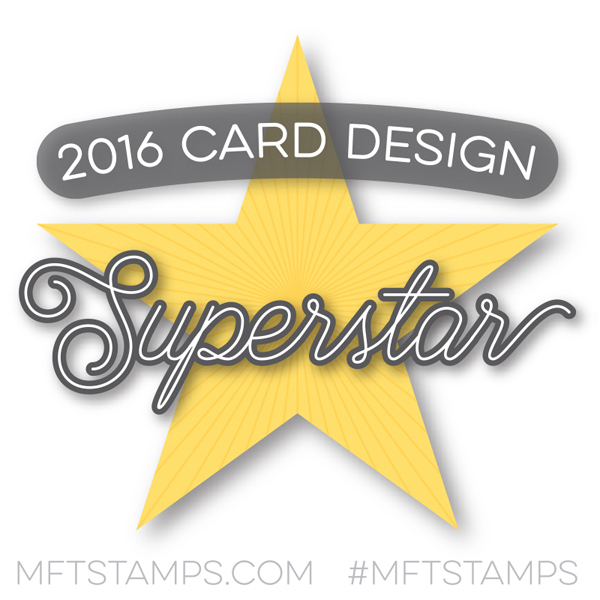 Congrats on your Guest Design spot! They are so lucky to have you! You'll be awesome! Wie ichd iese Karte LIEBE! Und so hamer coloriert. Vorallem der Bär!!! Sooo toll!!!!!!! !